Infected! Or: "How Craig's players managed to not take any combat skills." Recently, I was lucky enough to receive a surprise package from the guys at Esdevium games. One of the advantages of working for Geek Pride is being able to play with awesome toys, so when I opened the package and out popped a load of Avengers Heroclix, I was pleasantly surprised! 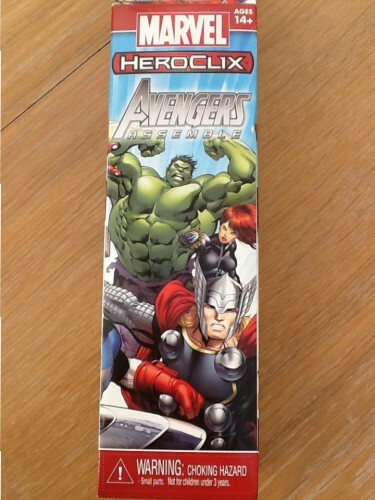 Inside the package was the Avengers Quick-Start set, the original Avengers Fast Forces set and ten Avengers Assemble Booster packs. 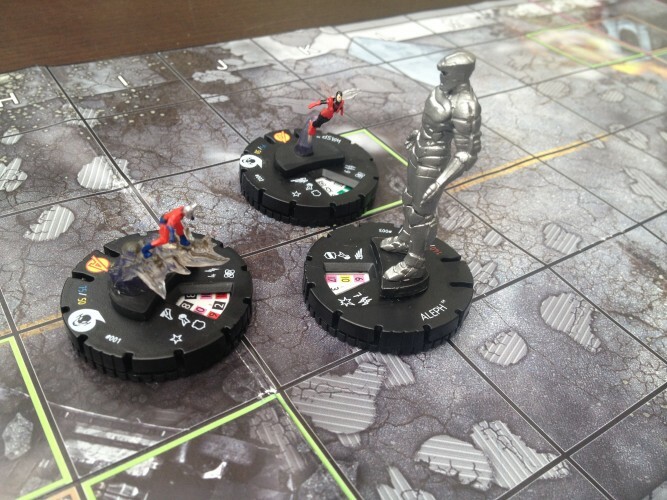 The Quick-Start set is a great starting point for anyone looking to get into Heroclix, and it sticks to a theme. 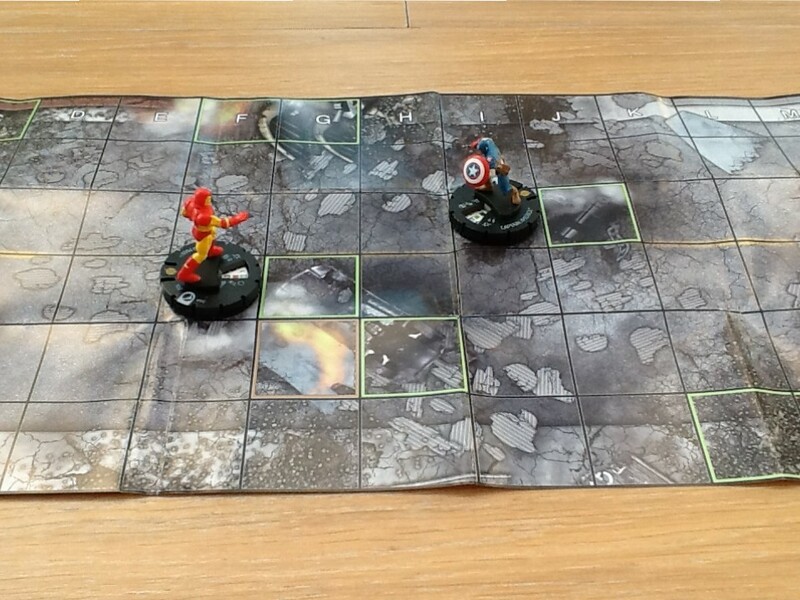 The Quick-Start set is a basic starter set, two figures, basic print of the rules and a small, printed board with which to play on. With the upcoming Marvel film Captain America: Civil War on the horizon, it also sticks to the theme: Captain America vs Iron Man. 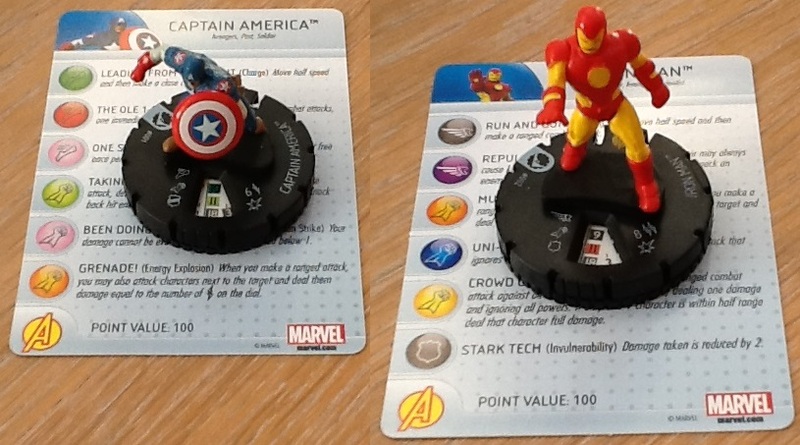 It is a good little starter set and, as you can see from the pictures below, they are pretty miniatures. It is a great starter and dirt cheap to boost, a good beginning for someone who is tempted by the world of Heroclix. Also here, the ability cards actually explain what the rules mean, something which later would come to haunt us, but more on that further in the article. For those who prefer the classic look of the Avengers, as opposed to the modern look, this is great. 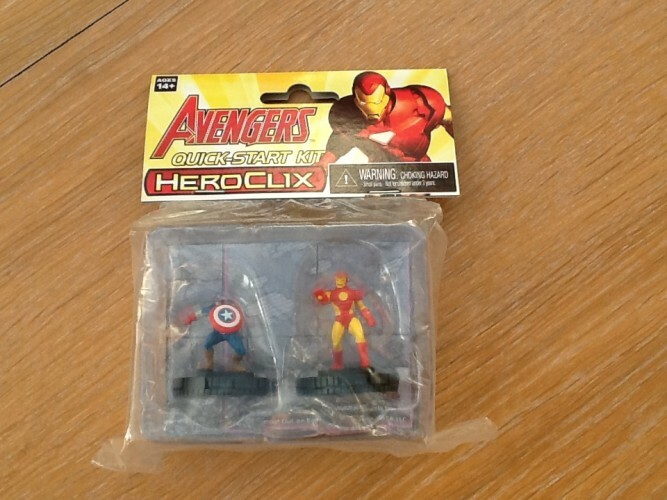 However, the gold Iron Man is a little over the top and Hulk looks like he is wearing a toupee. These criticisms aside, it is a good start for a serious collector, especially one who wants to collect the original Avengers, without buying lots and lots of boosters. 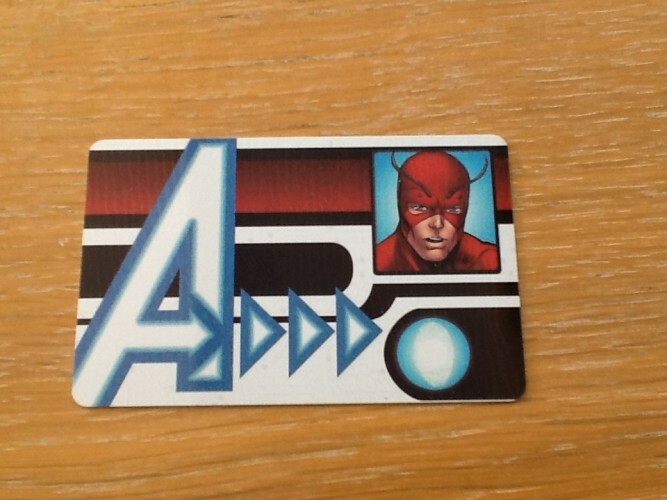 Each character comes with its own card, which describes their points cost, abilities, and gives them a little bit of background, such as notable appearance in the comics. 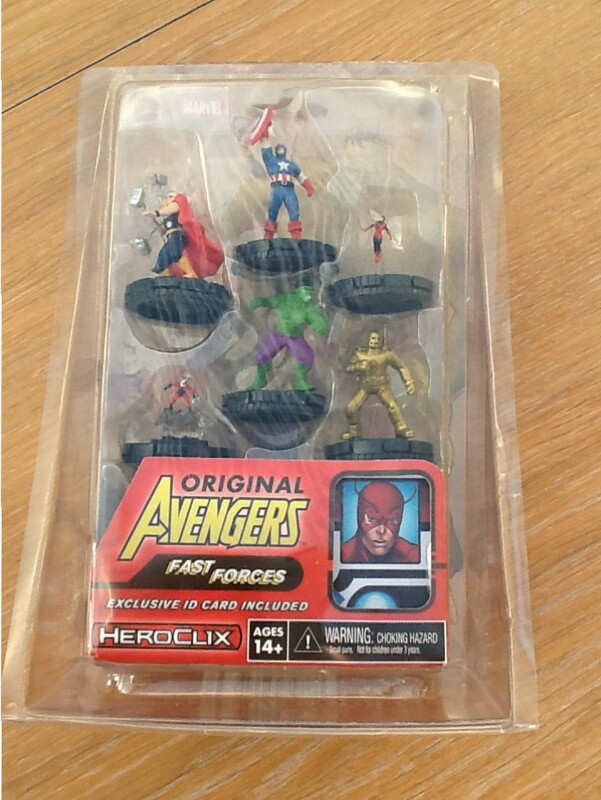 This is the same for each character in the Heroclix universe, each one gets its own card, it’s a good little addition to the game. These booster packs are hit and miss, mostly due to the random chance factor, which is the same risk you get in any game where you buy boosters. 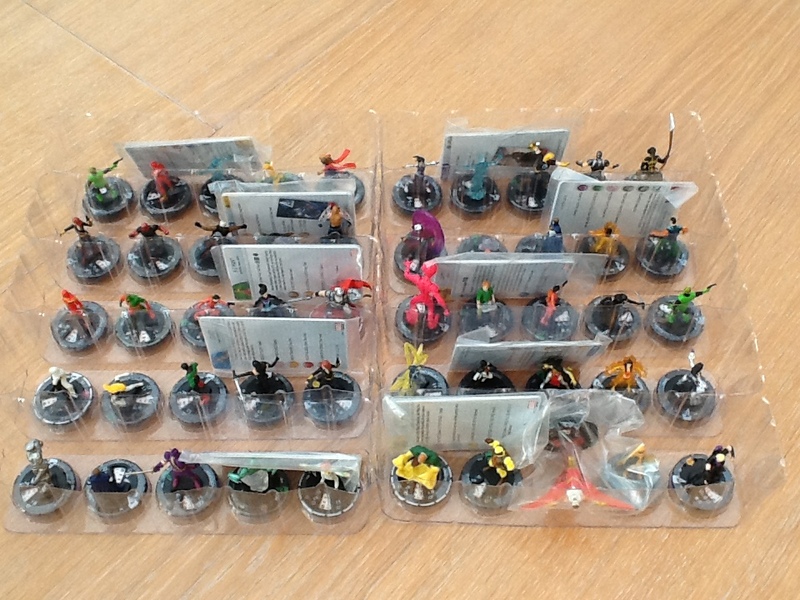 I was given ten to open and look through, that’s not a huge amount, but it is fifty new Heroclix miniatures to chance through. 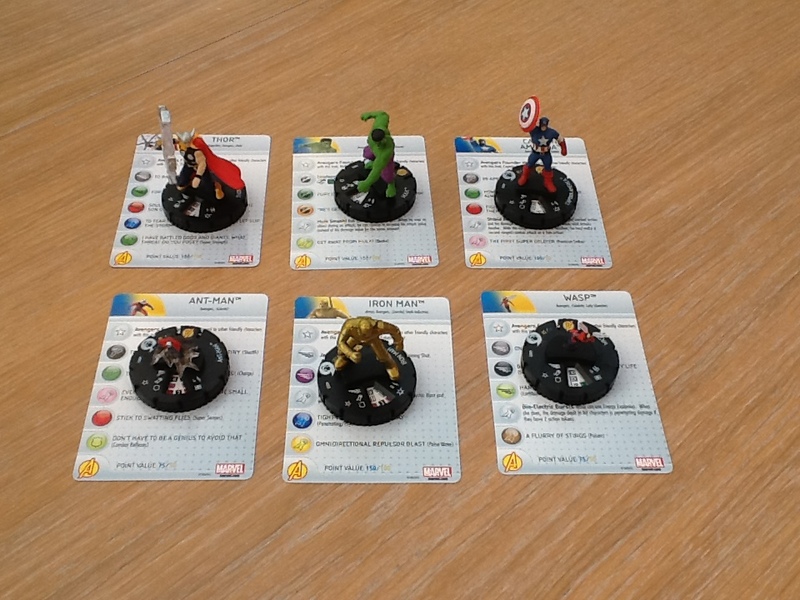 I was lucky and got one rare (King Thor for those interested), a couple of uncommon characters and a lot of commons; a standard trawl for ten boosters. I also found four rare action cards, these cards match specific characters to give them one off abilities; very cool! Surprisingly, I didn’t get a lot of the same miniature, I only got three characters twice, which is only six. Again, this couldn’t be helped, boosters are designed to be random, so overall I was a happy chappy. 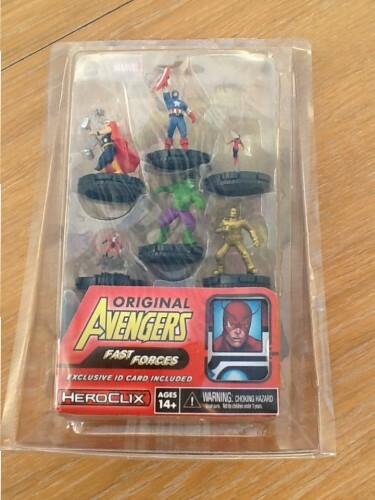 What made the boosters awesome was the fact that I managed to get Hawkeye, Falcon & Black Widow, basically meaning I had the entire film cast from the current film franchise. This made using my imagination much easier and also allowed my other half (lucky her!) to understand the game much easier. I mean, she loves the Avengers, so giving her the choice of the entire team, what can go wrong? 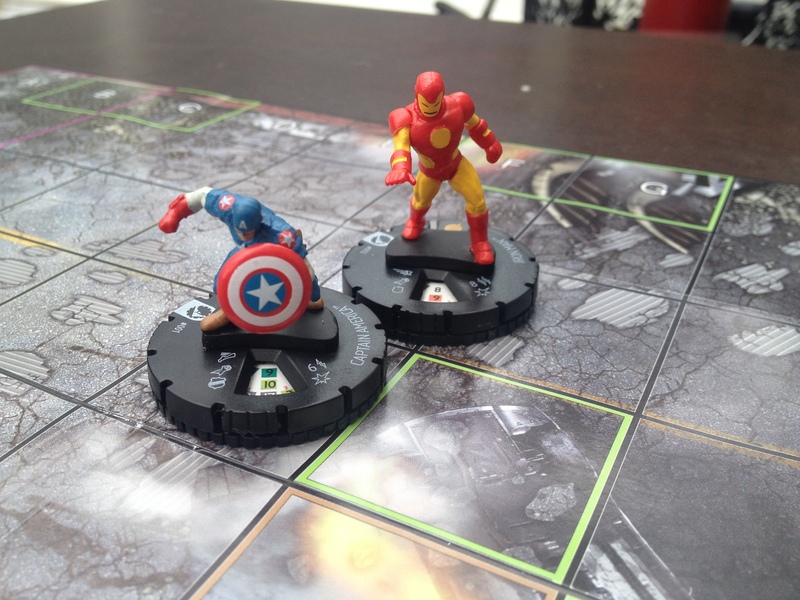 After a few games, the quick-start rules are great for beginners, but don’t answer questions raised by both of us. 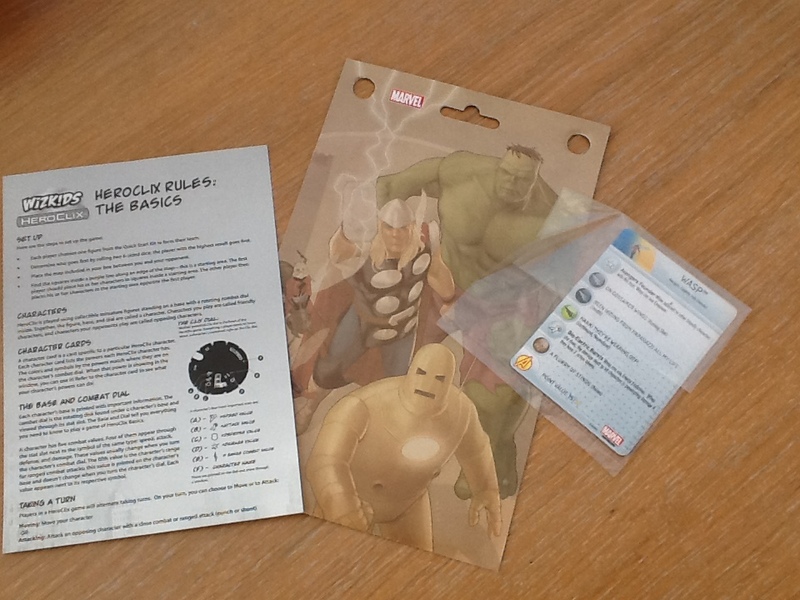 The cards have rules on that don’t have an explanation within the provided rules, which isn’t a main issue, but it means downloading the rules set from the website. In modern times, especially with the mobile revolution, it is simple enough to download the PDF with the rules on and have done with it. Yet it seems like a missed opportunity, only the Quick-Start set had the card abilities explained, without the rules we were in the dark. Sadly no set had dice, which is a requirement to play the game. Obviously the Quick-Start set is designed to be picked up and played, but two six sided die would have fit in and been welcomed. Again, not an epic issue, especially for us seasoned gamers; I have more six sided die than I ever need. However, for a complete newbie, it could have been the end of their journey. Finally, my only other criticism is what lies with the entirety of the Wizkids model line: the paint jobs are sometimes third rate. With Fantasy Flight Games, the painting of their miniatures is something that they take a little pride in; neat, tidy, tight. 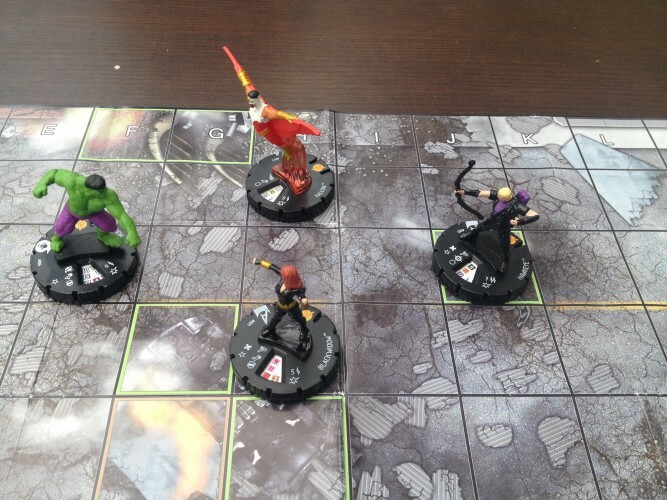 With Wizkids, at points, they just look like someone has either transferred a face onto a miniature, or daubed it in paint. No neat lines, no focused paint job, and it leads to minor disappointment. Paint jobs don’t make a game, but one of the shinning reasons of playing a game like this, is not having to paint the miniatures. Being an avid wargamer, it is essential that my miniatures look “Good enough”. 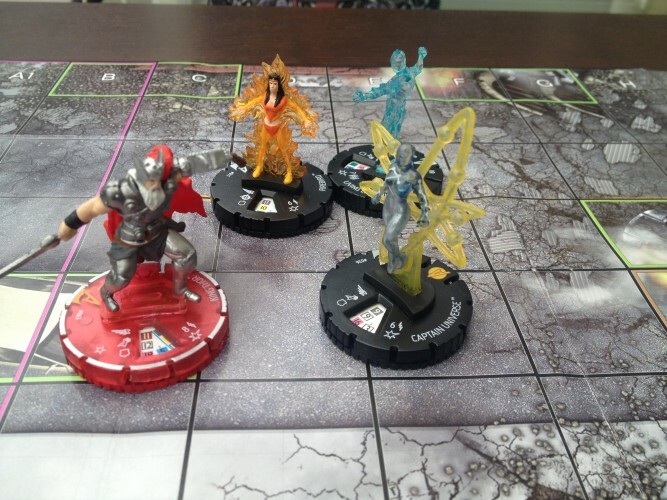 With Wizkids that never seems to happen, and I often wonder would it be worth the money. Falcon, Black-Widow & Hawkeye try to slow down a Hulk rampage! If you enjoy the gameplay more than the aesthetics, then you will love all the above. The gameplay is smooth, simplistic and easy to understand. There are no complexities that hound the game, no specific rules that cloud the game; just simple fun. I know that we had fun playing with the miniatures that Esdevium games provided, and we will continue to have fun with them. So what you waiting for chum, why don’t you pop out and grab your own Quick-Start set today. Let me know what you think, or have your own say, in our comments section.